A scaled-down version of a plan by the artist Christo to festoon 26 miles of Central Park's walkways with swatches of translucent saffron-colored fabric has been given a crucial vote of support by the Central Park Conservancy, which helps manage the park. The project, which would be installed in February and remain in place for two weeks, still awaits approval by the city's parks department, but the vote on Monday by the Conservancy's board is significant. Mayor Michael R. Bloomberg, too, has said he supports the project, making approval by the parks department likelier. The project was rejected in 1981 in the wake of vehement opposition to what was seen by critics as a gross intrusion into the city's most beloved and important green space. This time, a "policy statement" approved by a majority of the park conservancy's board concluded that the project "could move forward without damage to the park and without impeding the recreational use of the park by the public," provided that issues including financing and security were resolved. Evelyn H. Lauder, who serves on the conservancy committee that studied the project, said: "My position has always been caution in terms of ecological impact. All those problems have been answered by them. So I'm very happy because I think it is a very exciting and dynamic possibility." In a much-chronicled career, the Bulgarian-born artist and his wife, Jeanne-Claude, have wrapped the German Reichstag and the Pont Neuf in Paris in cloth. They surrounded part of the coast of Australia in sand-colored fabric, hung an orange curtain across a gap in the Grand Hogback Mountain Range in Colorado and dispersed several thousand umbrellas across southern California. The Central Park project would include a trail of thousands of rectangular steel gates, each 15 feet tall, supporting individual panels of billowing cloth that would outline the park's winding promenades. The gates would begin at the park's pedestrian entrances and continue at nine-foot intervals. Among the Central Park Conservancy board members to vote in favor this time was Gordon J. Davis, who as parks commissioner 21 years ago rejected the project in a 107-page document that concluded the project was "in the wrong place at the wrong time and in the wrong scale." Among those to vote against the project on Monday was Richard Gilder, an investment manager who pledged a $17 million challenge grant to refurbish the Great Lawn and is a conservancy founding trustee. The conservancy's approval came with the condition that the work, known as "the Gates project," undergo significant modification: construction and installation with no excavation; fewer than 7,500 gates rather than the 15,000 originally proposed; no interference with trees or sensitive park areas like the reservoir and Ramble; and minimal use of large trucks and forklifts. The board also stipulated that the February installation date replace the original October proposal. The conservancy still wants more information on such issues as the project's financing, the impact on wildlife, and what will be done to keep parkgoers off grassy areas where bulbs are growing. The project has been given new life in part because of support from the mayor, who has generally championed the importance of public art, particularly since the events of Sept. 11. Deputy Mayor Patricia E. Harris said it was premature to comment on the development. Christo collaborates on his creations with his wife, and they finance their projects themselves from sales of Christo's work. Reached yesterday by phone at home in Manhattan, Jeanne-Claude said she was unaware of the conservancy's support. "We don't even know that," she said. To the artists, the process of seeking approval is part of the art itself. "The negotiation is part of the artistic focus," Mrs. Lauder of the conservancy said. "To eliminate obstacles is part of what they perceive as their process." ... *Christo's a lot of fun. *I can't wait to see this. I had no idea Christo was still alive, kicking and doing this stuff........ haven't heard of him since the Riechstag. 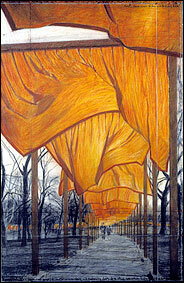 The artists Christo and Jeanne-Claude came up with a plan 23 years ago to erect gates draped in saffron-colored fabric in Central Park. Thousands of them would meander along pathways for two weeks during the winter when the trees are bare so the gates could be seen. Then they would be removed. A simple, slightly mad idea, and beautiful. Since then this husband-and-wife team has wrapped buildings, surrounded islands with pink floating fabric, installed giant blue and yellow umbrellas, and strung miles of curtains at locales from Florida to California to Japan to Europe, turning doubters into converts, while New York City, art's supposed capital, has dragged its heels. Last week the Central Park Conservancy passed a resolution giving its support, basically. Christo and Jeanne-Claude said yesterday that they still had not heard from the conservancy, a private organization, which donates millions to maintain the park. Meanwhile it turns out that the artists have been negotiating a contract with the Parks Department. They are reluctant to talk about it. They don't want anything to spoil progress, having got so close to approval after so many years. Yesterday they told me that an announcement by the city may come very soon. Mayor Michael R. Bloomberg has already said he likes the idea. Charlatans? Shamans? With their hard-sell tactics, their followers trailing them like Deadheads from one gig to the next, their feel-good populism and phenomenally expensive, grandiose ambitions, it's no wonder Christo and Jeanne-Claude have made skeptics of people who haven't seen their work, don't understand it or don't want to, and who won't take them seriously. I remember going to the "Wrapped Reichstag" in 1995, expecting the worst. Then, like so many people, I was won over by the whole giddy event: the revelers who turned the fields around the Reichstag into Woodstock East, the art students sketching the building, the street vendors, the grumpy politicians, the store windows full of wrapped objects — above all by the beauty of the project. Briefly the hulking building became a kind of shimmery gift to the city, swathed in a million square feet of silvery polypropylene fabric held in place by 10 miles of bright blue rope. When the last roll of fabric was unfurled by a crew of climbers resembling Lilliputians atop Gulliver, someone cranked up a hurdy-gurdy. The crowd applauded. Then the building was unwrapped a few weeks later, leaving nothing behind except the economic benefits of tourist dollars: Christo and Jeanne-Claude always pay for their own projects by selling his art. The Reichstag wrapping cost $13 million. Berlin, a German newspaper said, made about $700 million in increased tourism. The artists also bequeathed to the city the worldwide afterimage of a gentler Reichstag. The symbolism was a new Germany emerging from the chrysalis of the wrapped building. They came up with the Reichstag idea in 1971. Resistance and negotiation are part of their work: everything that happens from concept to completion belongs to the project, they say; this is a basic tenet of Conceptual Art. They have been pondering something big in New York since the mid-60's, shortly after immigrating from Paris. First Christo proposed wrapping two downtown buildings, then wrapping the Museum of Modern Art, One Times Square and the Whitney Museum. By the 70's they imagined the gates to celebrate the rambling, organic system of pathways through Central Park, in contrast to the grid of streets. This interaction between order and disorder encapsulated art at that moment. The rectangular shape of the gates combined with the windblown fabric made a classic Post-Minimalist statement about man-made systems and nature. The project was turned down in 1981, when the Parks Department feared it would damage the grounds and set a dangerous precedent. Gordon J. Davis, then the parks commissioner, produced a report arguing against it. Mr. Davis is now a conservancy board member, and he voted for it this time. In 1995 Disney showed "Pocahontas" in the park on four 80-foot-high screens to tens of thousands of people crammed onto 120,000 square feet of artificial turf under 56,000 watts of light, listening to a 400,000-watt sound system before a gigantic inflatable Mickey. So much for dangerous precedent. If the legacy of Frederick Law Olmsted and Calvert Vaux, the park's legendary designers, could survive that, what's the problem with the gates? Anodyne, critics say about Christo. But public art does not consist only of artists leaving black boxes with "Fear" on them in subway stations. There's a fruitful territory between yelling "Fire!" in a crowded theater and erecting a statue of a forgotten hero holding a sword. Christo's work derives from 60's happenings and Earth Art, from the general move out of galleries and museums into the real world, and from the utopianism of Socialist Realism (he was born in Bulgaria in 1935), with its belief in art for everyman, agitprop and the gigantism of Soviet monuments. He has transformed all this into a transient brand of visual entertainment. A little of that wouldn't hurt New York City now. After 9/11 the project can show the world the city's creative vitality, emotional health and sense of humor, and be a complement to the proposals for downtown. It would require at least another year, and probably a few years, for the project to be realized even if a contract were signed today and no legal hitches occurred. (They better act while this mayor is still in office.) Besides the money to be raised (Jeanne-Claude mentioned to me $20 million as a possible amount), there are 74 tons of steel to be designed, around a million square feet of fabric to be woven, cut and sewn, and workers to be hired and trained. And more planning. Last June, with Douglas Blonsky, the Central Park administrator, Christo and Jeanne-Claude surveyed the park, recording the precise width of walkways and heights of the lowest branches. The present plan is for about 7,400 gates, each 16 feet high (a foot higher than they originally proposed), with an average of 12 feet between gates. (There will be some gaps to avoid branches and other obstacles.) The widths of the gates will vary from 6 feet to 18 feet, to match the widths of walkways. Instead of slender steel poles, as first proposed, the gates are now to be 5 inch by 5 inch fabricated recyclable vinyl poles extruded in the saffron color of the fabric, which is no longer attached like a shower curtain but built right into the frame, like sails into masts. Each gate will have a slender one-ton steel base. The gates will rest only on walkways, so no holes with be dug or grass disturbed. Teams hired by the artists will take about six weeks, using small forklifts, to install the bases, another week to raise the gates. The park will be open as usual. Then the fabric will be unfurled in a day, ceremoniously. The teams will maintain and guard the gates, hand out fabric samples as gifts, act as docents to the curious, then take the gates down after two weeks. Six weeks later everything should be gone. At Christo's and Jeanne-Claude's studio I watched a short video of models of the gates, tested in Washington State, where the artists' chief engineer, Vince Davenport, lives. A van drove through the gates to make sure emergency vehicles wouldn't be obstructed. The fabric (it doesn't hang lower than seven feet) billowed nicely in a breeze. Christo pulled out some drawings and a book about the project. The gates are shown to fill the park, drawing orange paths up and down hills and stairs, around the lake, zoo and Met Museum — a vast, whimsical abstraction in the land. To the city, as "Wrapped Reichstag" was to Berlin, "The Gates" could be more than a popular attraction and profitable. Art, even a temporary installation, maybe especially a temporary installation, when it is good has a way of leaving an indelible mark on a place and the people who see it. Its value is civic and psychological. As a successor to the image of the collapsing Twin Towers, the picture of a winter park filled with people streaming through gates of fabric could be priceless. At the least, it would show New York City was willing to take a gamble on art. Here's hoping a contract is signed. Then it will be up to private donors to decide whether the project is worth the cost. Museums pay millions for some exhibitions. Knicks players are paid millions and lose. Who's to say what's too much? Considering how much money street vendors make hawking postcards and geegaws of the World Trade Center these days, it shouldn't be too hard for Christo to sell images of his project to raise cash. Meanwhile temporary public sculptures, as part of the last Whitney Biennial, have proved that Central Park can accommodate art and survive. The park is gorgeous without gates. It might be gorgeous with them, too. NEW YORK (Reuters) - Artistic duo Christo and Jeanne-Claude have finally won permission to snake a fluttering orange sculpture through 23 miles of New York's Central Park, ending a decades-old debate, Mayor Michael Bloomberg said on Wednesday. 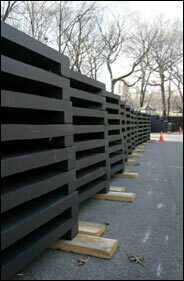 The exhibit -- ``The Gates, Central Park, New York, 1979-2005'' -- will be erected in February 2005 and stand for two weeks. Christo is famous for his giant temporary works of art, such as wrapping the Chicago Museum of Contemporary Art in a tarpaulin and wrapping Berlin's Reichstag in 1 million square feet of polypropylene fabric. The Central Park work by the husband-and-wife team will consist of 7,500 16-foot-high gates draped with saffron-colored fabric parading along about 23 miles of public paths in the park. ``I predict, whether they love this temporary work of art or not, New Yorkers will certainly make 'The Gates' a very popular topic of conversation,'' Bloomberg said at a news conference. The mayor predicted the project will attract half a million out-of-town visitors and generate $72 million to $136 million in economic activity. First conceived in the late 1970s, the project ran into environmental objections. Among them were the thousands of post holes to be dug in the park to secure the tall upright structures. In this version of the installation, recyclable vinyl poles will be secured by narrow steel base weights on the paved surfaces of the park's walkways, with no holes in the ground. Pedestrians will be able to pass under and through the work, drawn as sort of a whimsical tunnel without sides, with cloth draped from cross beams shivering in the wind. The artists say they will pay for the project themselves and pay $3 million to use the city park. Christo said New York inspired him as ``probably the most walking place in the world,'' and that the only places where people walk for pleasure are the parks. The gates and panels will be made in local workshops and factories and transported in pieces to the park for installation. Good going! It will cost us NOTHING, spur tourism and they will give money to the Parks Dept. 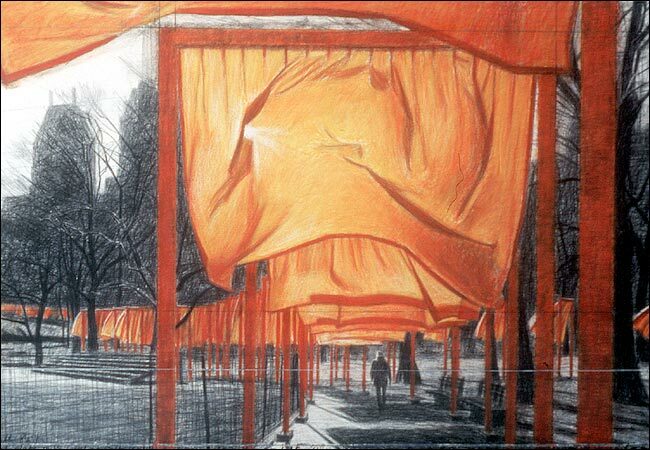 A large detail of a drawing of Christo's project to hang saffron-color drapes in Central Park. How many miscreants,in furtive search of future profits,will come to the park,running with scissors and ready to clip a pirce of Christo? In 5 years,they'll advertise their clippings on eBay for the same price as a Yankee's ticket. To prevent this tattered assault on Central Park's experiment with European High Art,a large number of the *diminishing police force will have to patrol the hell out of CP. Art affecionados will be coming out of the dark,bearing machetes,lusting after instant fortune by claiming THEIR piece of Christo. And New York will pay for the protection of this masterpiece,just wait. Otherwise,Christo appears,and "pouf",there is no Christo. While February 2005 may seem like eons away, it is not, at least for Christo and Jeanne-Claude. That is when the artists will finally realize their 24-year-old dream of decorating 23 miles of Central Park's walkways with 7,460 gates, 16 feet tall and topped with translucent saffron-color fabric. Whether wrapping the Reichstag in Berlin with more than a million square feet of aluminium-colored fabric or swathing the Pont Neuf in Paris with 454,178 square feet of a champagne-colored textile that shimmered like silk, Christo and Jeanne-Claude have always financed their mammoth undertakings themselves. They raise money by selling Christo's drawings and collages, as well as early artworks of wrapped objects from the 1950's and 1960's. "Each project is like a child — it costs whatever it has to cost," said Jeanne-Claude, who estimates the gates may cost up to $20 million. While the potential for marketing products related to this project is almost limitless, the artists have never allowed any licensing or taken any such initiatives themselves. Until now. For the first time, they have agreed to let the Carriage House Center, a nonprofit organization in Manhattan that oversees a consortium of foundations, have the exclusive worldwide rights to set up licensing agreements for products based on the Central Park project. None of the proceeds will go to the artists or toward producing the project: everything goes to protecting and restoring New York City's natural environment and supporting arts causes. Deutsche Bank Americas is joining the initiative, giving $250,000 in seed money to become a corporate founding partner with the Carriage House Center. The center's president, Theodore W. Kheel, the former labor negotiator, has worked with the artists since they filed their first, unsuccessful application with the city to do "The Gates Project for Central Park" in 1979. They have remained friends. "They offered to give the city marketing rights, but the city was not in a position to accept them," Mr. Kheel said in a telephone interview this week. "Knowing about the Carriage House and my interest in environmental matters, we agreed to work together." Mr. Kheel is passionate about helping raise New Yorkers' awareness about dangers to the city's environment, which he says is an issue "as serious as terrorism but not as immediate." Mr. Kheel and Deutsche Bank executives say they do not know how much money they will be able to raise through licensing, nor have they determined what kind of licensing efforts to embark upon. Paul Wilmot, managing partner of Paul Wilmot Communications, has been asked to help develop licensing programs and seek additional corporate sponsorship. Gary Hattum, president of Deutsche Bank Foundation, a philanthropic arm of the bank, said he saw its involvement as a way to support the city, the environment and the arts. "We view this as seed money that is an investment," he said. "It will have a long-term legacy for the city." The evolution of the widely anticipated outdoor work of art for New York City initiated in 1979 by the husband-and-wife collaborators Christo and Jeanne-Claude will be the subject of the exhibition Christo and Jeanne-Claude: The Gates, Central Park, New York, on view at The Metropolitan Museum of Art from April 6 through July 25, 2004. Some 45 preparatory drawings and collages by Christo, 40 photographs, and 10 maps and technical diagrams will document the soon-to-be-realized work of art, which when completed will consist of 7,500 saffron-colored gates placed at 10- to 15-foot intervals throughout 23 miles of pedestrian walkways lacing Central Park from 59th Street to 110th Street and from Central Park West to Fifth Avenue. 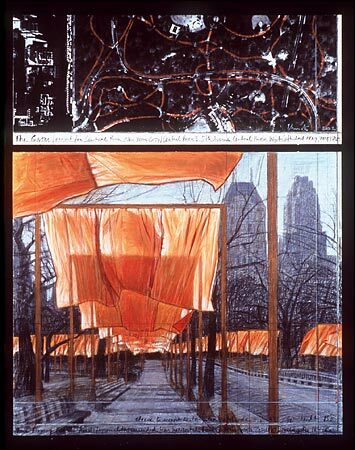 A collage depicting part of Christo's plan to bring saffron to Central Park next February, the culmination of a quarter century of effort. You might think that after more than 40 years of grand-scale achievements, like hanging a curtain between two peaks in a Colorado valley; running miles of fence through two California counties; outfitting several islands off Florida with tutus; wrapping the Pont Neuf in Paris; and swaddling the Reichstag in Berlin, the indefatigable team of Christo and his wife-collaborator, Jeanne-Claude, would at last run out of ambition. But no. With their eyes ever on the Big Apple, the two had long plotted a Christofest in Central Park. And after two and a half decades of refining the work and banging on official doors for a hearing, they are about — thanks to Mayor Michael R. Bloomberg's approval — to achieve their goal, with a project called "The Gates." It is logistically one of the team's most complicated to date, and certainly, at 25 years, the longest in gestation. Christo's feat is hailed as "a tribute to the grandeur of Central Park and New York City" by Philippe de Montebello, director of the Met (which will itself be in direct line of the enfilade). But the installation is also a testimony to the team's inexhaustible skill and patience in the manipulation of officialdom, the imposition of an artist's will on a very public domain. Does Central Park really need Christo's embellishment? With Christo and Jeanne-Claude, the conceptual process — the technical problems, the political arm-twisting, the fund-raising, the public relations-maneuvering and the documentation relating to their projects and, of course, the power play involved in achieving them — is as much a part of their art as the visible, sometimes beautiful but always temporary, end product. Like everything else the team does, the chronological documentation of the forthcoming event on view at the Met is as yawningly thoroughgoing as, say, a space exploration log, sparing the viewer no detail. Christo's drawings and collages show the installation from every vantage point, close-up to panoramic. Some are small and humdrum, others elaborate and impressive, like an eight-foot-long collage dated 2003, depicting the banners close up and receding on their long march, with buildings in the background. This work is topped by an aerial photograph of Central Park and a sketch of some technical details with an actual snippet of fabric. The photographs, mostly by Wolfgang Volz, exclusive photographer for Christo's projects since 1972, range from the first meeting between Christo and Jeanne-Claude and their lawyer, Theodore W. Kheel, with Gordon J. Davis, then the New York City parks commissioner, in April 1980 (a poignant note here is the visible advance in age of the participants as the years roll by), to a meeting of Community Board 8 in March 2003, at which the artist's contract with the city is explained by Jack T. Linn, an assistant commissioner of parks and recreation. And then there are samples of the tangible results of all this busyness: solid steel bases each weighing between 614 and 815 pounds; steel leveling plates to ensure the verticality of the poles; the vinyl poles themselves; the fabric panels (each rolled around a cardboard tube three inches in diameter in preparation for unfurling); bolts and self-locking nuts that will total 165,704. Whew! These dumbfounding statistics make it clear why the cost of this enterprise is estimated to approach $20 million (including a $3 million donation by Christo to the Central Park Conservancy). The artist has always said he supports his enterprises through the sale of drawings and models, with no government funds involved. And as for the materials themselves, Christo says they are all subject to recycling. But what about the end product of all this? In all fairness, that can't be weighed until the actual installation is in place. Supposedly that installation will result in no damage to the park. Yet there's no denying that Christo's work has in the past achieved some beautiful effects. I will always remember the magical sight in 1972 of the orange Valley Curtain suspended between two hills against a background of grayish peaks in Rifle, Colo., lasting for nearly a day before the wind destroyed it. Nor will I forget the stunning view, from a helicopter, of the bright pink skirts inflecting the tiny green bits of land they billowed out from in the "Surrounded Islands" project of 1983 in Miami's Biscayne Bay. Neither of these, nor any of Christo's other projects, as far as I know, was destined to be permanent. The successful struggle to realize them, and then to document their existence, seemed to satisfy the artist. Paradoxically, it's the ephemerality of his ambitious projects that give them their true strength. Operating on a grand scale, boldly moving in on nature or man-made architectural schemes, he has the chutzpah to work his way with them, then walk away, leaving echoes in living minds and documents for the archives. It's not a bad way of imposing art on us; after all, look at the ugly public statues that now pepper the park. Unlike Christo's work, they aren't temporary. 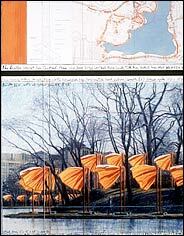 "Christo and Jeanne-Claude: The Gates, Central Park, New York" is on view at the Metropolitan Museum of Art, Fifth Avenue at 82nd Street, (212) 535-7710, through July 25. Details of the installation were announced at a news conference by Deputy Mayor Patricia E. Harris; Parks and Recreation Commissioner Adrian Benepe; Cultural Affairs Commissioner Kate D. Levin; Schools Chancellor Joel I. Klein; and Cristyne L. Nicholas, the chief executive of NYC &amp; Company, the city's tourism marketing group. For 18 months organizing the installation has been like pulling together "a military operation,'' Mr. Benepe said. The artists have historically paid for all their public art projects, which over the years included wrapping the Reichstag in Berlin with more than a million square feet of aluminum-colored fabric and swathing the Pont Neuf in Paris with champagne-colored textile, through the sale of their artworks. They estimate "The Gates, Central Park, New York City, 1979-2005'' will cost about $20 million. Bets on whether the "ripped from the headlines" Law &amp; Order episode featuring a foppish, egomanicial "Artiste" will air this season or next? One of Christo's drawings for "The Gates," works that are being sold to help finance the giant project. Under the watchful gaze of the creators, a crew of roughly 100 workers began lowering thousands of steel bases onto the walkways of Central Park yesterday in preparation for the biggest public art project the city has ever seen, at least since the park itself was designed in 1857: "The Gates," by the artists Christo and Jeanne-Claude. The workers, who ranged from musicians to out-of-work actors to forklift operators, gathered at 7 a.m. at the Central Park Boathouse for a briefing by, among others, the artists. A little while later, at the staging area at 102nd Street just beneath the Harlem Meer, where the steel bases were stacked, men and women in yellow vests waved orange caution flags at pedestrians while others, wielding measuring tapes and string, began carefully placing the bases in areas designated with a stenciled maple leaf, about 12 feet apart. Eventually, the bases will support 7,500 gates festooned with saffron-colored fabric panels along 23 miles of the park's pedestrian walkways - from 59th Street to 110th Street, east and west. The $20 million project, a quarter-century in the making and financed by the artists, will go on full view on Feb. 12 and remain until Feb. 27. It is expected to attract thousands of art lovers from around the world. The artists are trying to create "a visual golden river appearing and disappearing through the bare branches of the trees, highlighting the shapes of the footpaths," according to a brochure explaining the project. The color was chosen to cast a warm glow over the park at a gray time of year. Though Christo and his collaborator and wife, Jeanne-Claude, were in the park yesterday greeting the crews, most days Christo has been closeted in his SoHo studio making drawings of the gates as fast as he can. As soon as he finishes a work, Jeanne-Claude gets in touch with an interested collector or museum to try to sell it in order to pay for "The Gates." "He only has 40 more days left to make the preparatory drawings," Jeanne-Claude said in a telephone interview on Sunday. "Once 'The Gates' are up, Christo stops drawing." In 2004, she said, the couple sold $15.1 million worth of Christo's creations, everything from recent drawings of "The Gates" to a sculpture of a life-size storefront dating from 1964, which the Würth Museum in Kunzelsau, Germany, bought for $3 million. They also sold a significant amount of work in 2003 that will go toward the current project's cost. In addition to the passionate collectors from around the world who have bought their work, Jeanne-Claude said, museums like the National Gallery of Art in Washington, the Whitney Museum of American Art, the Solomon R. Guggenheim Museum, the San Diego Museum in La Jolla and the Würth Museum have all purchased drawings of "The Gates." The largest of these have been selling for $600,000. The artists have historically sold their work to pay for all their public art projects. Over the years, these have included wrapping the Reichstag in Berlin with more than a million square feet of aluminum-colored fabric and swathing the Pont Neuf in Paris with a champagne-hued textile. Two years ago, when Mayor Michael R. Bloomberg first announced that "The Gates" would come to Central Park, he, along with officials from the New York City Parks Department and the Central Park Conservancy, emphasized that the project would not cost the city a penny. Christo and Jeanne-Claude are responsible for paying for all materials, labor and installation. They have also agreed to pay the city for additional security during the period that "The Gates" is on view. For several months the cafe in the Central Park Boathouse has been taking reservations for lunch and dinner during the 16-day exhibition. Officials at the Metropolitan Museum, whose rooftop is being opened especially for visitors to view the project, say both its trustees' dining room and its Petrie Court cafe have been taking reservations for the same period. Turning "The Gates" from the artists' 26-year dream into a reality has taken years of planning and testing. Vince Davenport, the chief engineer and director of construction, and his wife, Jonita, the project director, have been working alongside Christo and Jeanne-Claude since 1989 - for the last three years exclusively on "The Gates." At their home in Leavenworth, Wash., they created a life-size test where 18 gates were installed for seven months through the rains, snow and high winds of winter. "I'm under the gun now," Mr. Davenport said. "I sleep till about 4 o'clock, and then my stomach starts churning." He has supervised every detail that has gone into the making of the gates themselves, from finding the right materials - which include more than 5,000 tons of steel, about two-thirds of the amount used to make the Eiffel Tower - to figuring out with park officials how to get the materials from assembly plants in Queens into the park in a way that does not disturb the public, to making sure the installation is as simple as putting together a giant Lego set. "There are so many details," he said. "You have to be ready for anything." He has bought 150 snow shovels to clean the paths, in case it snows. From a trailer adjacent to the Central Park Boathouse, the Davenports run a command center. Mrs. Davenport handles the day-to-day details. She also hired the crew of 1,100 workers, who have come from 45 different states. The couple moved to New York two years ago to work on "The Gates." It is by far their biggest logistical undertaking, bigger than wrapping the Reichstag or planting a forest of giant umbrellas in rice paddies near Tokyo. "You cannot overplan something like this," Mrs. Davenport said. "Our children are grown up, so we can devote 110 percent to the project." Describing the workers, she said, "We have retired Air Force people, doctors, lawyers, engineers, architects, teachers." Many people who work on Christo and Jeanne-Claude's projects, she explained, have had experience in the film industry or in organizing events like rock concerts. There are several different kinds of workers; the most inexperienced are paid the minimum wage, $6 an hour, plus one free hot meal a day; professional workers, like the forklift operators, are paid a salary for the entire project. All the hiring was done by e-mail messages. Once word spread that they were gearing up for "The Gates," Mrs. Davenport said, she received inquiries from more than 2,000 applicants, out of which she chose 1,100. "Christo and Jeanne-Claude give first preference to local workers," Mrs. Davenport said. "And to those who have worked on previous projects. They recognize loyalty." Each worker gets a special "Gates" uniform (to keep) designed by Christo. Jeanne-Claude declined to describe it, saying she was afraid that if she did, there would be a rash of knockoffs for sale. Traditionally, Mrs. Davenport said, the workers are a jovial group. "Lots of long-lasting friendships are made," she said. "There's always a baby born after every project. But this one is in winter, so we'll have to see." Thousands of steel bases will hold "The Gates," an artwork by Christo and Jeanne-Claude now being installed in Central Park.